I've long wished that I could speak German so that I could understand the poetry of Wagner's opera scores in the original language, but now I have a still better reason: My Swiss friend Peter Bührer has written the most stunningly beautiful and useful guide book of New York City that I have ever seen, and it's 85% in German. On a recent visit to New York, Peter and I sat at Balthazar for two hours going through the huge book page by page. Finally I showed the waitperson how Balthazar was listed in the book to keep her from throwing us out! (It worked.) If I had only one statement to make about this book it would be what I told Peter after turning to the final page: Every New Yorker should be born with this book. Actually, he said it first but it was just what I had been about to say. He said Every New Yorker should have this book. For this New Yorker, it was like a sentimental trip through all the special places of my life plus places I hadn't even known about that were practically right next door! This book is more than just beautiful and informative, it's fun! The illustrations are all by the renowned artist James Rizzi and there are all sorts of extras affixed to the pages, in the form of post-its, post cards, DVDs, and even prepaid credit cards, for example, one that will give you free rides on the water taxi. In describing his chef d'oeuvre, Bührer says: It is the first city guide ever, worldwide, which is completely illustrated by an artist, not just a graphic designer, a top pop art artist and native New Yorker. I tried to show the variety of New York in a very clear way and want to inspire other people to keep their eyes open in that fantastic town. Peter Bührer loves America the way I love France--maybe even more. When I first met Peter in Zurich he owned a restaurant called Oscar, a golden retriever named Oscar, and was a died in the wool Americanophile. (This is a real word but not used nearly as often as Francophile or Anglophile--could it be because fewer people...In any case, I think it really should be changed to Ameraphile!) Since our first meeting, Peter has worn more hats than I can keep track of: author of many cookbooks, host of radio and tv shows, consultant to the first class menu on Swiss Air, journalist, husband, and father to 4 daughters. He has also been my friend for many years, starting from the moment that he invited me to his restaurant in Zurich and I discovered, after asking to see his kitchen and meet his staff, that the restaurant was about to close and that he had been functioning as host, sommelier, and chef. That's Peter--a whirlwind of quiet, intense energy that does more than one would think humanly possible. This book is a synthesis of all his multifaceted talents, intellect, humor, and passion. The book is at the top of the German Amazon site and hopefully will soon be translated in English. However, it is useful even in German to English speaking people, as the index, headers, and names and addresses of places are all in English. And, of course, the illustrations speak 1000 words. If you're coming to New York for the first time, this book will serve you well. If you never come to New York, or are from New York and leaving, this book will provide an unending sentimental journey. And for those who don't enjoy the prospect of carrying around a seven pound book, there is also a pocket book version. It comes with a colorful, semi-gloss, fold out map of every street in New York plus subway map, complete with Rizzi illustrations. For a sneak peak at some of the illustrations and information in the book, complete with background sounds of New York City, click here! Just last month I moved all the books, piled high on the coffee table, to my New Jersey place. 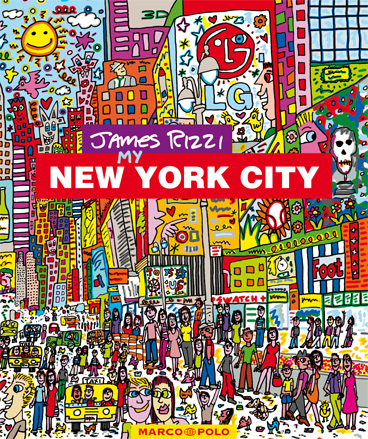 Peter Bührer's James Rizzi My New York City, however, has found a permanent home on the border of Greenwich Village and SoHo on my coffee table, where it belongs.